Some Weekend and Sahl Hasheesh are bringing the Hot Creations boss this Easter. Music getaway Some Weekend made a big splash with their first edition last year, which saw the likes of San Proper, Kornel Kovacs, Amp Fiddler, Bobby Analog, Steven Julien and Sweely take the decks alongside over 15 of Egypt’s finest DJs and live performers. The retreat took place in Sahl Hasheesh this past October over different locations ranging from boats, to piers, to courtyards. This year Some Weekend is making an early return to Sahl Hasheesh during the Easter break, and hosting Outs:de's season closer in the process. 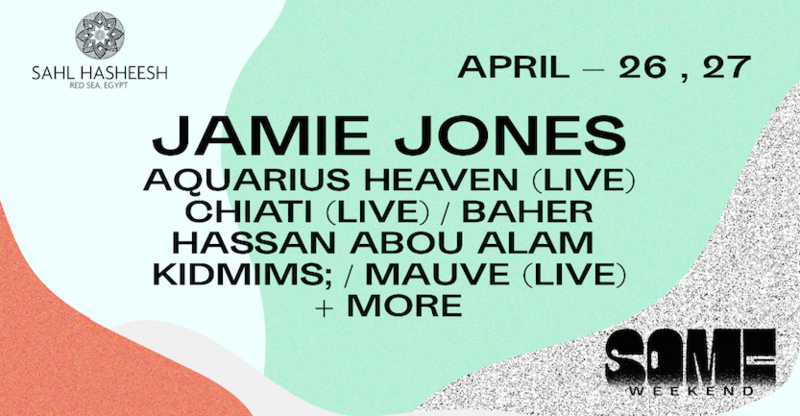 The even more exciting news is that they’ve already locked in the stellar Jamie Jones, who’ll be performing for the first time in Egypt. Other confirmed, visiting names on the lineup include Aquarius Heaven (Live), No Regular Play, Death On The Balcony, along with local artists Chiati (Live), Mauve (Live), Baher, Hassan Abou Alam, Abou Samra, Akladios, Kidmims, Nour Fahmy and Shady Noor (Live); with more headliners and supporting acts to be announced soon. Take a peek at what went down at Some Weekend 2018. Follow Some Weekend on Facebook, Instagram and head to their event page for more info. Main image by Koury Angelo.